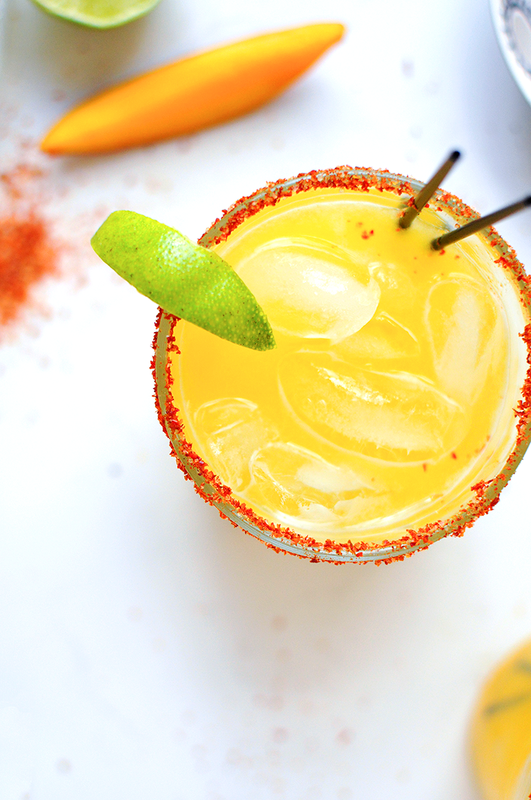 Mango Margaritas + a Foodie Girls' Getaway Weekend in Chicago! 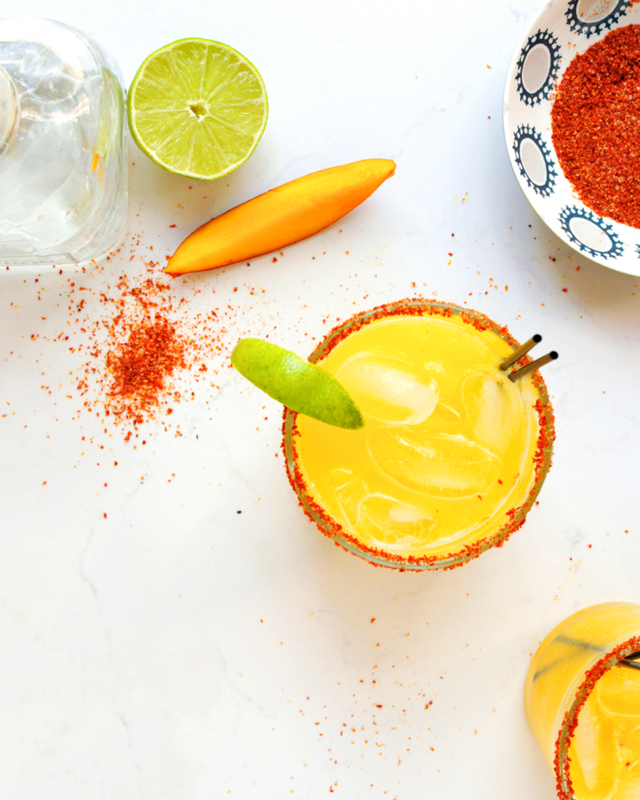 I'm so excited to be joining the #DrinktheSummer blogosphere party today and sharing these gorgeous, super flavorful mango margaritas with you, inspired by my foodie girls' getaway trip to Chicago this summer! Drink the Summer was kindof my summer theme. I even went to a cocktail making class, hosted by the lovely Jayme of Holly and Flora, with a girlfriend of mine. (girl time + cocktails!) 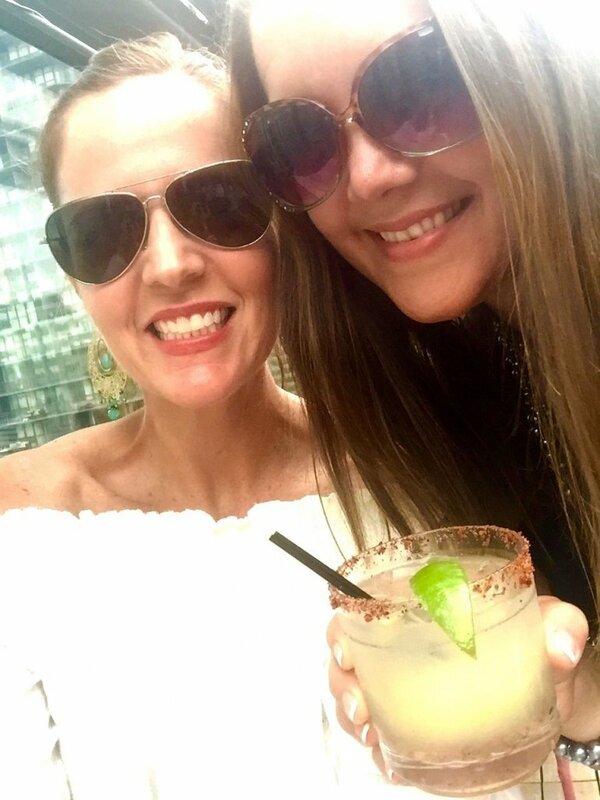 And I had the privilege of spending an entire girls' getaway weekend with Lauren of Lauren Kelly Nutrition in Chicago... and it was seriously, the most fun. Eating at some of the city's best restaurants, drinking, massages, facials, shopping, walking all over town, and laughing soooooooooo much! 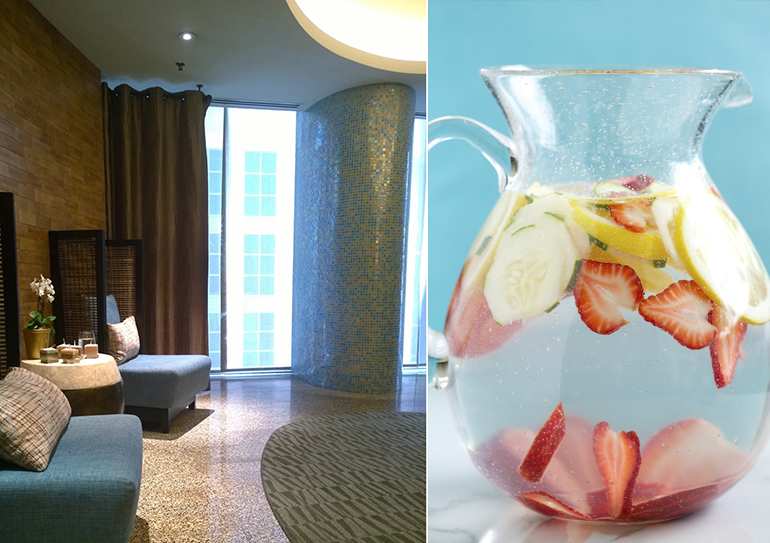 We stayed at the fabulous dana hotel and spa. 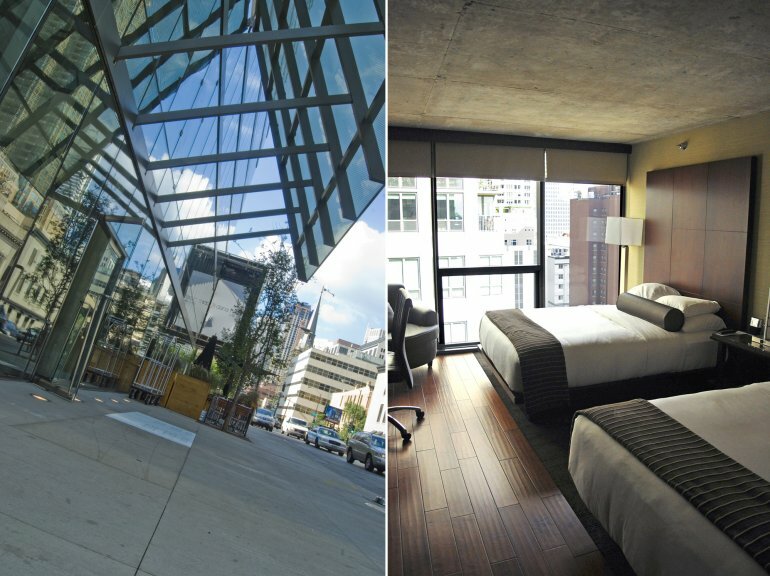 It was beyond gorgeous, super modern (dark wood floors, concrete ceilings, white crisp bedding, floor to ceiling windows, an upscale bathroom, etc... ), a super convenient location (just steps away from Michigan Ave.)... and everyone there was so helpful and kind. It was the perfect place to call "home" for the weekend. AND there's a full spa inside the hotel, just an elevator ride away. What girls' getaway weekend is complete without a massage and facial?! The whole experience was totally luxurious and relaxing. They add strawberries to their cucumber water, and I wanted to drink it by the gallon. 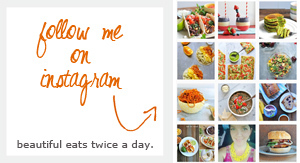 Try this recipe at home! 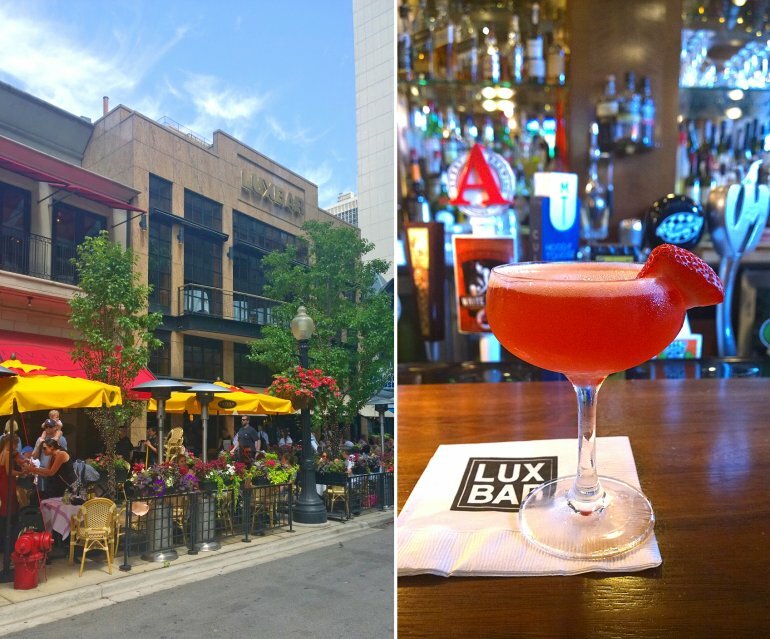 We ventured out a few blocks for lunch to LUXBAR chicago. 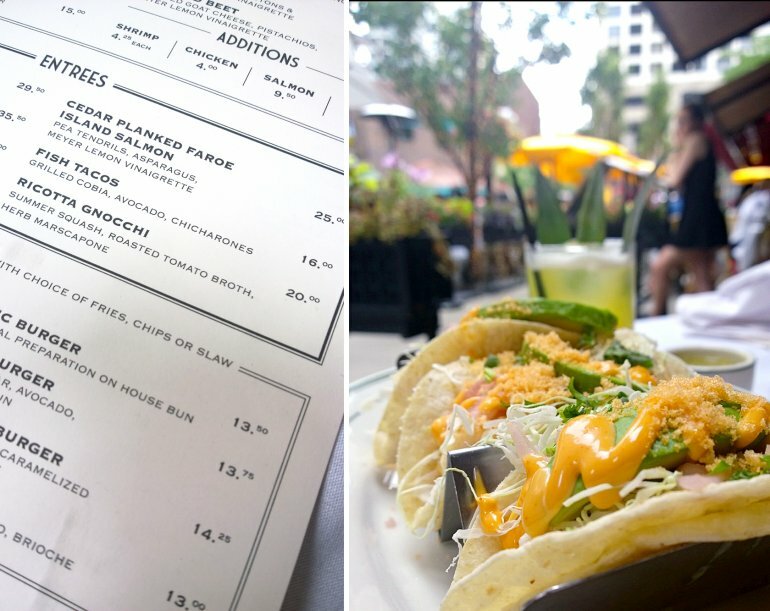 Gorgeous drinks, delectable eats, and the most beautiful outdoor patio on a quiet street. I highly recommend the Strawberry Fields cocktail made with Effen vodka, fragoli, giffard vanilla, and prosecco. As you probably know, I am completely obsessed with fish tacos (and tacos in general). Like these and these and these and these. 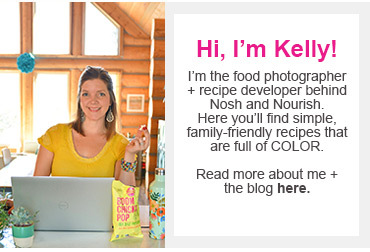 I'm thinking my next cookbook should be all about tacos (anyone interested?!) Please?! So, when I saw the fish tacos on the menu, I couldn't pass them up. The best news: They were some of the best fish tacos I've ever eaten!! And they paired perfectly with LUXBAR's pineapple "I-THINK-I-CAN-BEAT-MIKE-TYSON" cocktail. 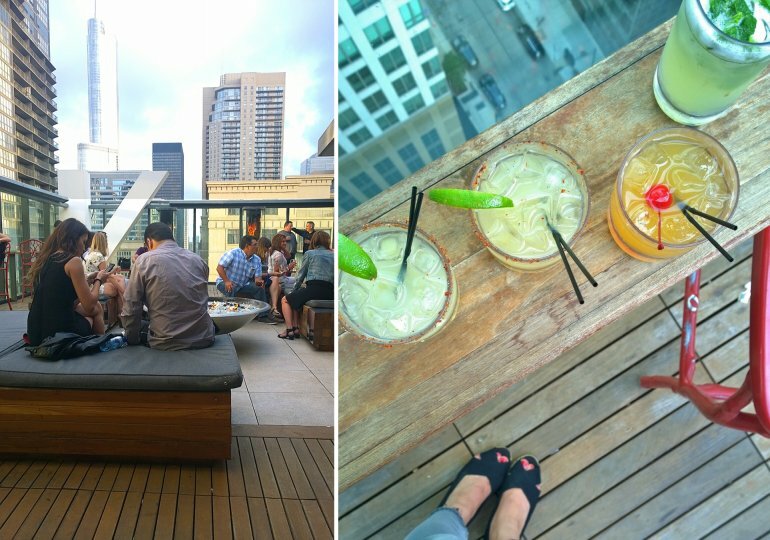 No girls' getaway weekend to Chicago would be complete without an evening spent at the Vertigo rooftop bar on top of dana hotel and spa! Lauren and I totally loved the vibe -- and tried lots of different things while enjoying the gorgeous views, the beautiful weather, and the modern decor. Lauren's favorite: the peach mojito. Awwwww, aren't we cute?! Can you tell we are having the BEST TIME together?! We're already planning our next weekend getaway! Where should we go? LA? NYC? Portland, Maine? Let us know in the comments below! We had dinner at the Green Zebra, a chic vegetarian restaurant a little outside the city center. We totally loved the concept of this restaurant, lots of small plates to share with your friends so you get a few bites of a lot of different things. 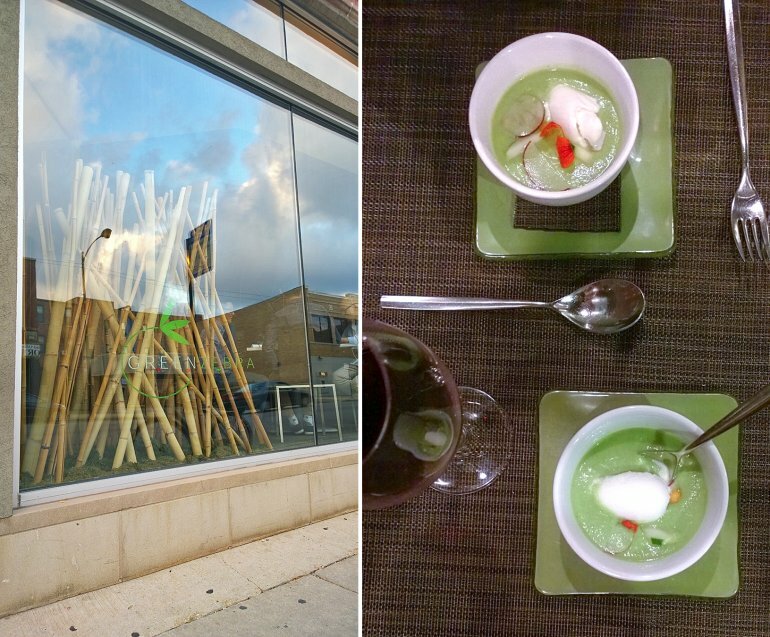 Everything we tried was absolutely delicious, even things we might not have normally ordered, like the mushroom pate with raspberry sauce and the chilled cucumber and avocado soup with lemon sorbet (so refreshing and flavorful!!). The gnocchi with grilled corn and summer truffles was out of this world! We had brunch at Seven Lions where they have an extraordinary build-your-own-bloody-mary bar, though Lauren and I opted for the mimosas. 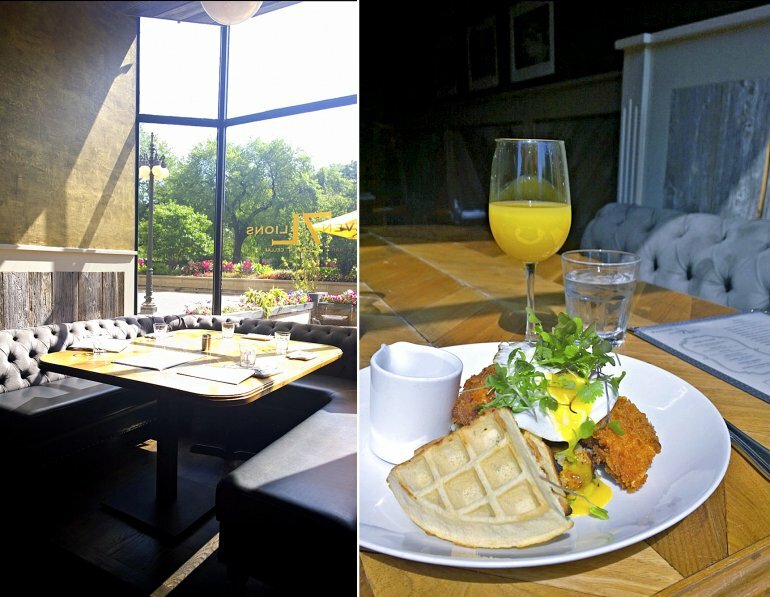 I had their signature chicken & waffles, with a savory twist --- green onion + cornmeal waffles topped with fabulously crispy chicken, delicate greens, and a fried egg on top. Oh my starzies was it good!!! Seeriously, one of my most favorite breakfasts... ever. So, now what a lot of you have beeen waiting for... mango margaritas!! Mine are a bit brighter orange than the inspiration drink from Vertigo. And that's because they use mango liqueur (in addition to the silver patron tequila). And I used actual mango nectar/juice instead of the extra liqueur. My husband was taken aback by the "spicy" rim, but by the end, his glass was clean because it pairs so well with the sweetness of the mango margarita! And because one cocktail (or six) is not enough, here's the entire #DrinktheSummer list!! Thank you to Isabelli Media Relations for coordinating our stay and meals throughout Chicago. Salt your cup's rim by rubbing a piece of lime on the rim, then dipping it in the chile lime salt. Set aside. In a cocktail shaker, combine the tequila, lime juice, mango nectar, and ice. Shake for approximately 30 seconds until thoroughly mixed. Add fresh ice to your salted rim glass. Then, strain the mixed drink and pour it over the fresh ice.